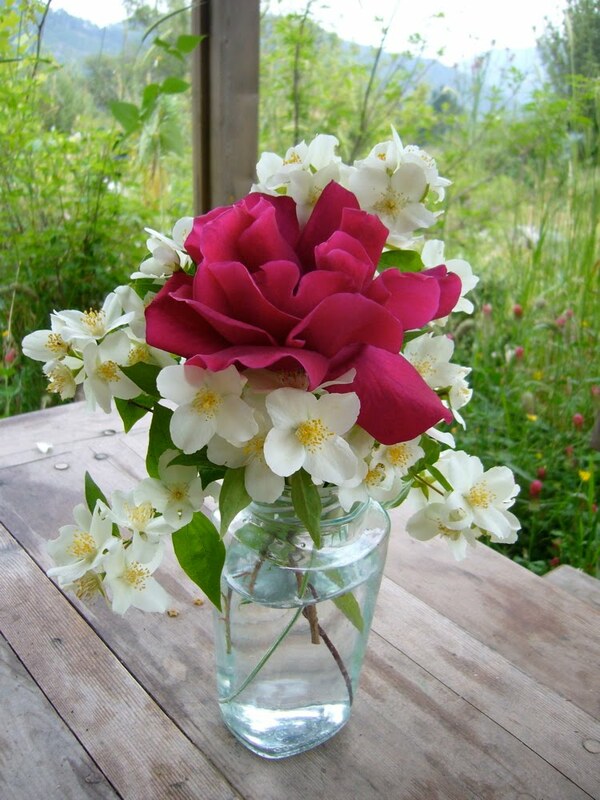 As we near summer, the attendant pleasures of having a garden have been slowly accumulating – salads eaten fresh from the garden, flowers on the table (above: mock orange/philadelphus and Etoile de Hollande rose, a heavily perfumed climber and all-round floozy), and evenings scented by flowers. We’ve even been eating mulberries from our tree, and have greedily taken stock of the flowers on other fruit trees. The warmer weather brings its chores, and we have started to think about bees again. Our bees fled last year, after months of assault from hornets, and we left the hives as they were, bereft. This was a mistake, I learned today, as I turned to the task of trying to clean them out. They had been entirely taken over by wax moths, and the hives were full of sticky cocoons. It was pretty gross, but the chickens liked the wormy little caterpillars, so I scraped them all out and put all the bugs into the coops. When I had cleared out all of the propolis and wax and swept the hives out, they looked inviting – hopefully, this year’s bees will thrive. We do have something in our arsenal to help things along – I got some Thymovar, an organic pesticide to repel varroa mites in the hives. We had a huge problem with mites last year, and that probably didn’t help while the bees were also trying to fight off predatory hornets. In the vegetable garden, we’ve had some good results with the Complete Organic Fertilizer we mixed up as per Steve Solomon’s instructions. It is really nice to have something to turn to – last year, not wanting to use chemical fertilizers, we didn’t really have a way of adding balanced nutrients to our soil. With the right tools, it all gets just a little bit easier. >i love the picture. you're natural with flowers. happy belated mother's day, sister!t.